This yoga practice is tailored for military personnel or any yoga practitioner looking to build strength, flexibility, resilience and mindfulness into their daily life. Featuring military Special Forces Service Members led by Liz Corwin, a 13-year military Officer and former Navy F-18 pilot, this sequence was produced by Gaiam as part of the Give Back Yoga Foundation’s Yoga Readiness Initiative. This project brings free yoga field kits to active duty military personnel, offering those who serve powerful practices to develop strength, resilience and inner peace. Liz Corwin practiced yoga and meditation to decompress throughout flight school and while deployed aboard the aircraft carrier. In her spare time, she began teaching other service members, including Special Operations Units, which eventually led to her new career as a world traveling yoga instructor. She has taught countless yoga classes throughout Europe and the United States, including tailored classes for service members previously deployed throughout the Middle East at the Warrior Transition Program in Germany. “Four years ago while on deployment aboard the aircraft carrier U.S.S. Truman, I began sharing my yoga practice with fellow service members. A year later I began co-teaching classes with my teacher Ann Richardson to larger military units. One morning as a team of Navy Seals were lying out their mats, a fellow ‘Frogman’ walked past. When asked by his teammates if he wanted to join, he sarcastically gave the typical response of… “Yoga? Yeah right”. Now usually I wouldn’t recommend trying to call out a Navy Seal after he is über hyped up for his morning workout. But as he walked away, my smart-mouth got away from me and I asked “What are you afraid of big guy?” No answer. For a moment I wished I could retract my words and zip them back into my lips. “That wasn’t very yogic Liz.” I thought to myself. But then I realized it WAS the question to be asked, but that it was not solely his question to answer. I had to ask myself, what was he afraid of, and could I possibly find a way to absolve this fear? Now I am no Navy Seal, but as a fellow service member, I understood his fear of slowing down. I understood his fear of letting go of the stress and intensity, it was his protection. It kept his nervous system on high alert. The element of fight or flight strongly in the fight category where it needed to be for him to perform his job safely. But maybe, just maybe, I could guide him to an hour of slowing down, breathing softly, moving with a different kind of intention. A place of balance. In that moment I realized my calling was to continue finding ways to share the transformation benefits of yoga to this community. We as yogis are called to serve others. In whatever way we can connect to most. Giving our time, our energy, our understanding, and our love unconditionally. But to do this, we must continue to foster our own warrior spirit. Discipline. Reverence. Love. These will keep us ready as warriors, strong and spiritually tough, so that we can fan our own flame in order to give to our own higher purpose. Our Yoga Readiness Initiative brings free yoga field kits to active duty service members, offering tools for developing lifesaving skills and coping with the traumas of deployment. Want to help? Share this practice with someone who can benefit…and, if you enjoyed this sequence, pay it forward by donating what you can. 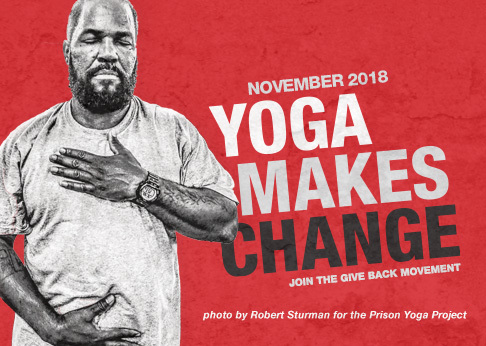 For every $75 donated, we can bring one free yoga kit to a service member. Sponsor a free yoga field kit for an active duty service member.